It should not have been a surprise since that’s exactly what it looked like when I walked out the door on Sunday after worship and fellowship. 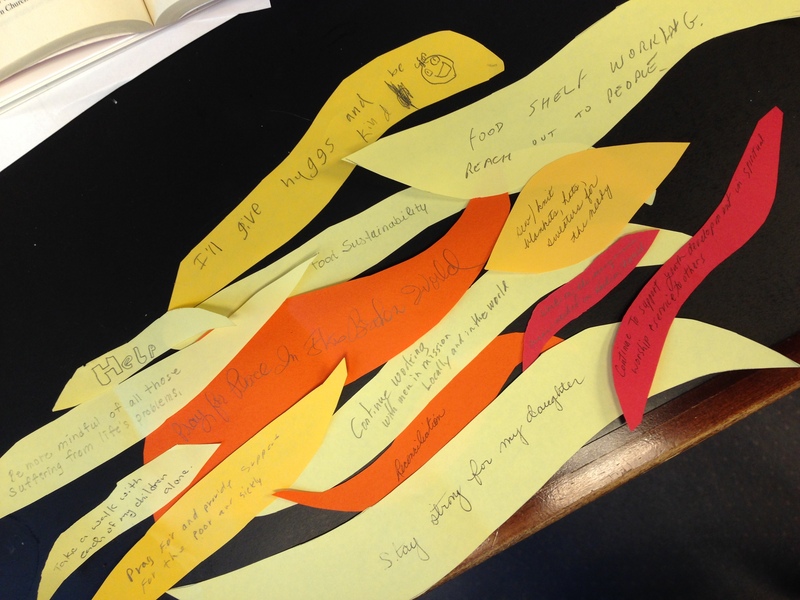 These are what my mom calls “little ones out of big ones” – the scraps left over from the flames my daughter was diligently cutting out to help me get ready for an activity we were doing in worship. It’s a mess, and a mess that needs to be cleaned up, but it is by no means the biggest mess in my office right now. It also isn’t the mess that got my first attention today. The office administrator’s computer was acting up, and I needed to use a combination of Google and YouTube to figure out how to fix it. My plans for the nursing home service were still a bit scattered and needed some organization. Some accounting for the transitional executive search committee I recently chaired needed to be worked on, as well as some details about benefits and payment for that new transitional executive. And none of these were anything like some of the more serious messes in the lives of the people I serve that I am privileged to enter into – surgeries, and aging, and cancer diagnoses. As I was driving my daughter to school this morning I heard a new-to-me song on the radio, “Mess is Mine” by Vance Joy. For some reason it really struck me. First it made me think about the blessing of those unique relationships in my life where this lyric is true “This mess was yours/Now your mess is mine.” Then I got to thinking about how this also describes both the vocation of pastoring and the church. When we are gathered by God into the church it doesn’t do away with our individual life messes. It doesn’t make us perfect. It doesn’t immunize us against pain and sorrow and heartache. Instead, when we are gathered together as the church (not just in the same physical location, but in the one body of Christ) the messes of one become the messes of all. We are bound together and the things that hurt one hurt all. When we are gathered together as the church we are given the responsibility and privilege of caring for one another’s messes, or as Paul said it in the letter to the Romans, we get to “rejoice with those who rejoice, weep with those who weep.” The job of the pastor sometimes is to be the visible sign and presence of the whole church in those messes. Those flames my daughter was cutting out were used in the middle of our worship service for people to consider how they might answer the Spirit’s call. No matter how many times I do them, I always get a little nervous when I include these participatory pieces in worship. I never know if people will actually participate, if the mess of trying something new and leaving some piece of worship, however small, disorganized and open to the unknown is going to be worth it. When I looked through the flames this morning, though, I was reminded that it was, that even this small act in our worship service was an opportunity for many of us to hear the call to enter into the messes of the world. First, thanks for the song – which is wonderful! 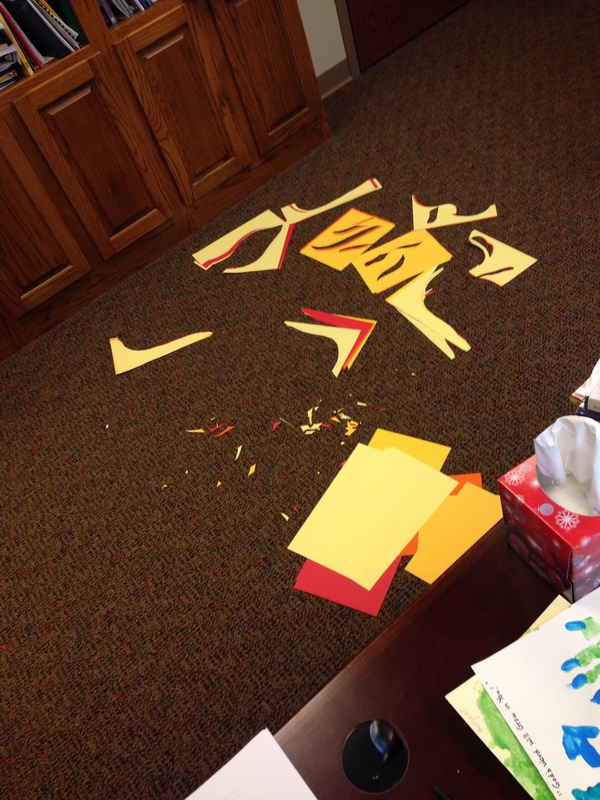 My office is also a mess and I love this metaphor of how our messes are shared in the body of Christ. Stephanie, you know I think you are the greatest and I admire you for juggling so much. The Body of Christ is and always will be a hot mess. What else would we expect on the liminal edge where the forces of good and the forces of evil clash? And I would not want to be called anywhere else, would you? Thanks for your writing.